A simple way to make wobbler plugs is to cut the head at a 45-degree angle, as shown below. However most of these plugs are made with a grooved head. To do this, cut the plug at the same angle, then carve out the head with a rotary file mounted in a drill press or hand motor tool. If you haven't got such power tools, use a small gouge to cut out the groove. To complete the wobbler plug you'll need three treble hooks and four screw eyes. To start the screw eye in the wood, first take an ice pick or awl and push it into the wood where the screw eyes will go to make small holes. Then put the screw eyes into the holes and twist them in. The screw eye which goes at the head of the plug (where the fishing line is tied) is forced in "as is". Pliers can be used to screw it in. The other three screw eyes hold hooks and if the screw eyes are closed they must be opened. Then slip a treble hook over the eye and close it. If you want to give the plug a professional look, slip small disc or cup washers over the shank of the screw eye before you force them into the plug (see illustration below). 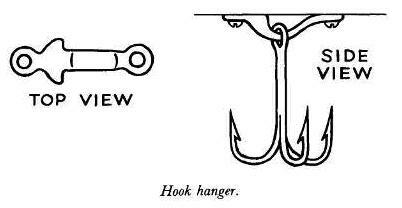 Two treble hooks are attached below the plug and the third at the rear or tail. Screw eyes make inexpensive simple hook hangers and are strong enough for most freshwater plugs. However, you can also use special hook hangers to attach the treble hooks. These are small metal saddles with a stop that prevents a hook from fouling with other hooks or the fishing line on a cast, or when the lure strikes the water. The hook hangers have two small holes on each end and are attached to the plug with small screws, as shown below.